I am so excited to be a part of The Chelsea Blog Tour today! Have you ever had a piece of clothing that you absolutely loved? A special dress, or skirt, or pair of pants that you just wore all the time because not only did you love the way they felt, but you loved how you looked in them? I used to have a pair of pants back in the 90s that I loved, but it wasn't love at first site. I bought them (yes bought - I wasn't sewing at that time in my life), to wear around the house. They were made of black knit material, had this seam down the front, and a flared leg. One day I got brave and wore them to work. I actually felt guilty about wearing them to work because they were knit! You didn't wear knit pants to work, at least not back then, and not in my mind. 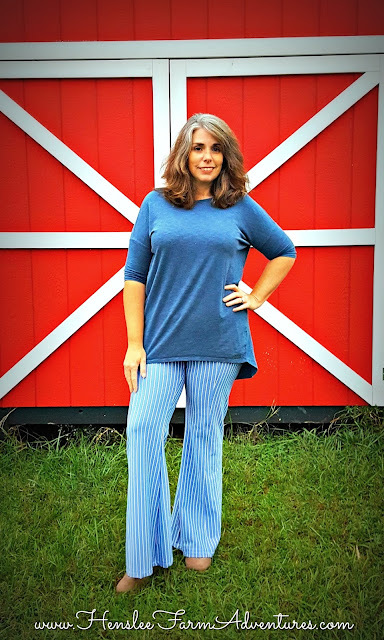 But I started styling them with cute blouses and even cuter boots and they very soon became a staple piece in my work wardrobe and in my date night wardrobe as well. In fact, I ended up wearing them so often that they became threadbare. I actually wore holes in them and I have never done that with any clothing I have had. I had to eventually throw them out. But because I loved them so much, I started looking for another pair. Fast forward 20 years (YIKES! 20 years! ), and I finally gave in to my sewing obsession. I love sewing for my family and me. I love how I can make clothes that not only fit much better than any ready to wear items, but that are also a higher quality. 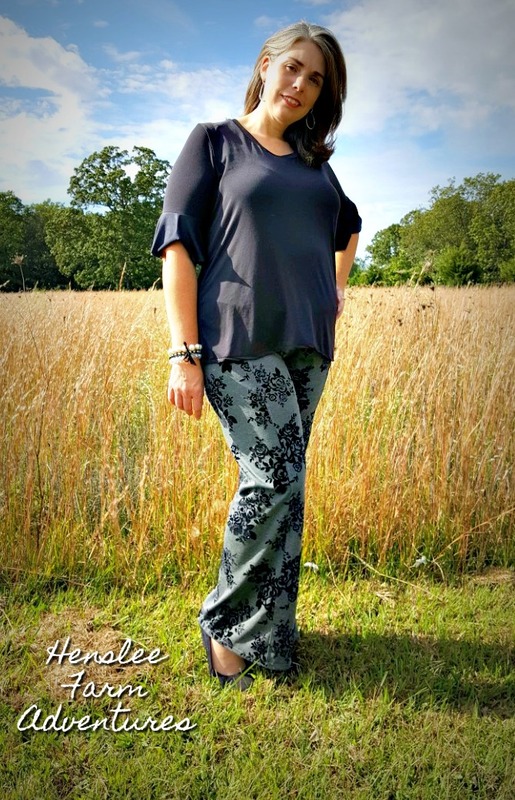 I have become a follower of a couple of sewing groups on Facebook and that is where I saw a post from Greenstyle Creations that was calling for testers for a new pattern for pants. 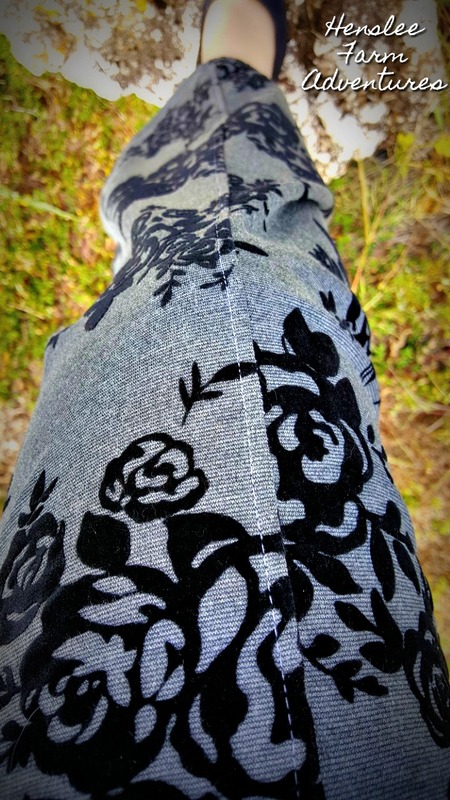 You can't believe my surprise when the picture of the pants was almost the exact same pair of pants that I had and loved 20 years ago! I had always been in search of a pair of pants just like the one I had, but never found any like them. I immediately signed up to be a tester and was so excited when I found out I was chosen! My third pair. I love this fabric! Even though I have been sewing (this time around) for about a year I still felt a little nervous being a tester for this pattern. I was worried at first if I would even be able to sew these pants. In my mind I could never do these wonderful pants justice. I also thought I would never be able to get that seam down the front to look good. I was pleasantly surprised to find out how easy this pattern really is to sew. And the front seam was not an issue at all. I don't have a coverstitch machine, so I just lengthened my stitch and top-stitched down the front. I love the detail of the front seam! Fabric is the Name of the Game! Different fabrics will give this pant a different look. The pattern calls for a stable knit. The reason is so you can see that bell bottom at the end of the pant. However you can use a DBP for a more relaxed version. It will still have a flare, it just won't stand out. When I made my three different pairs, I went with a more stable version in fabrics that were recommended. However between those three there are differences in how the pants look. My first pair used fabric that was very heavy (and also was very hard to sew), my second pair used a ponte, but not with as much stability as the first, and my third used a ponte but it was flocked making it heavier and more stable than the second pair, but not quite as much as the first. All three pairs turned out great and all three will be worn. My second pair I made. I love wearing these to work! Don't Stress Over the Pockets. When testing started, there were not pockets on the pants, but they were very quickly added to the pants. The pockets were something that I loved and desperately wanted, but I was questioning my ability. I made the pockets on the first pair and they actually turned out pretty good. However the pockets on my second pair of pants didn't turn out as well. On the third pair, I decided to leave the pockets off, but mainly because of the type of fabric I was using. That flocking just doesn't lend itself to being able to sew through multiple layers of fabric. The point is to try it and see how the pockets go. They look fabulous and they are a great feature to have. If you don't do so well the first time, then try again. The Flare is Not As Big As You Think. While I love the flare, I was worried how it might look on me. Yes, they mimicked the pair I had in the 90s, but back then bell bottoms were all the rage. Here we are right smack dab in the middle of the skinny jeans fad. My daughter Carly called my first pair of Chelseas my "Elvis pants" and you know what, when I had those babies on, I had an attitude. Even nuking my coffee seemed more hip with those pants. Carly may call them "Elvis pants" but I like to call them my sassy pants! I actually loved the flare. They were so flattering because instead of looking like an ice cream cone, it evened out my shape. These are my Elvis pants! I didn't think I would like my first pair, but I now love them! And Most Important: If You Haven't Tried Them Yet, You Need To! These pants are amazing! They are flattering on all body types! There were all sizes testing this pattern, and I did not see one person that these didn't look great on. And of course I love how easy they are to assemble and sew. I see a few more pair in my future...like a stretch denim and a corduroy. So here is some exciting news!! Along with this blog tour there is a giveaway! The first giveaway is The Chelsea pattern, and the second giveaway is stretch denim from Aurora Design Fabrics. Be sure and enter below! 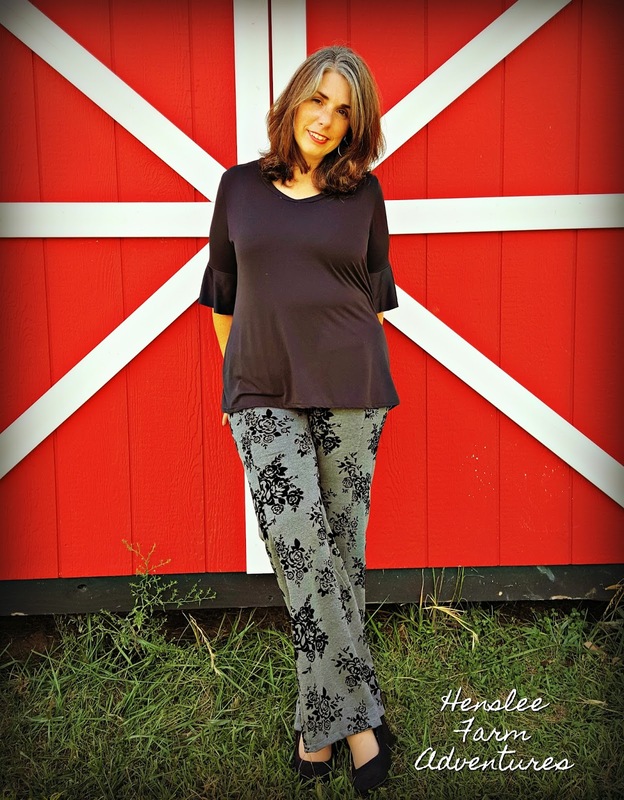 Thank you for sharing your sewing experience with this pattern with all of us! I have the pattern... now to just brave-up and make me some!!! I love the pocket detail and also the versatility in adding buttons to the band! I think all the fabrics would look amazing, but I especially like the grey! I'm nervous to try making clothes for the first time! But I think the Chelsea pattern is super cute and I have always loved the Bell Bottom look, and they look super comfy. 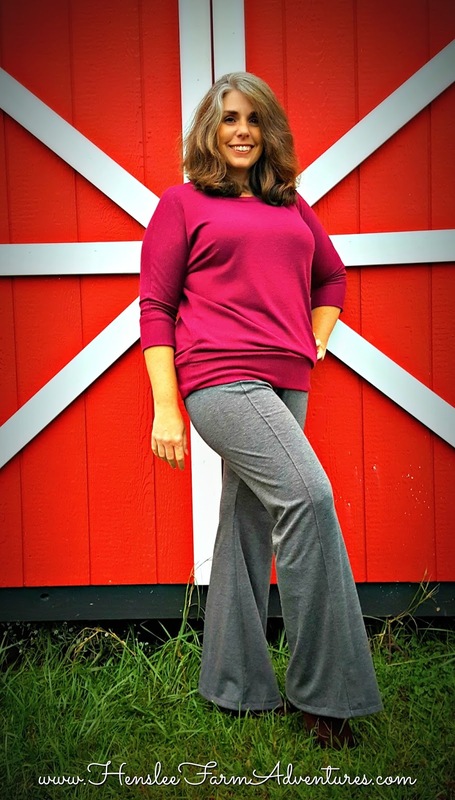 I like all three of the "With Ivory" colors in the Aurora stretch denim, but like the red with ivory the best! You look fabulous in your new pants! I love the style.